Formula One’s most successful driver has retired, this time for good. This series of articles looks back on the life and career of the phenomenon that is Michael Schumacher. Michael Schumacher was born in the German town of Hürth-Hermülheim on 3 January 1969 to parents Rolf, a bricklayer, and Elisabeth Schumacher. His younger brother Ralf, who would also become a Formula One driver, came along six years later. The family settled in Kerpen, where Michael would grow up and learn to race. The Schumachers were not well off, which would be a major barrier to motor racing for most aspiring drivers. Schumacher would therefore have to rely on talent to get him to the top. He had plenty of that. Schumacher’s first interaction with racing cars came at the age of four, when his father fitted a small motorcycle engine to Michael’s pedal kart. Michael proceeded to crash into a lamp post, which prompted his parents to take him to the local kart track where he became the karting club’s youngest member. Due to the family’s lack of finances, Michael’s early exploits in karting came in second-hand equipment. He would pick up discarded used tyres at the track and squeeze some more life out of them. He enjoyed the challenge of drifting and controlled spinning and particularly relished wet weather driving, often practising in the rain while his competitors might choose to stay off the treacherous track. There can be little doubt that such preparation assisted in turning him into one of the great wet weather Formula One drivers in history. To say Schumacher was a good karter is an understatement of ridiculous magnitude. He demolished the opposition at almost every level, starting in Kerpen where he won the club championship, and going on to victory in the German junior championship two years in a row. 1985 saw Schumacher finish runner-up in the world junior championship at Le Mans. At senior level, Schumacher finished third in the 1986 European championship before taking the 1987 German championship and winning the European title in the same year. Karting was the beginning of Schumacher’s journey in motor racing, as it has been for so many other Formula One drivers, including Ayrton Senna and Lewis Hamilton, but inevitably it was time for the young Schumacher to move on to cars. His success in karting attracted the notice of various team bosses who wanted to get him into single seaters. Schumacher’s first forays into car racing came in German Formula Ford and Formula König in 1988. His success in the latter series was an indication of things to come in Formula One – Schumacher won 9 out of the season’s 10 races, stood on the podium in every race and took the title with ease. His performance was noticed by Willi Weber, who ran the WTS Racing team in the German Formula 3 championship. Weber signed Schumacher on a two-year contract, and his driver duly delivered results, winning two races in 1989 on the way to third in the championship, and taking the title the following year with five victories from 11 races. Schumacher also won the prestigious Macau Grand Prix in 1990, beating his future F1 rival Mika Hakkinen after contact between the two put Hakkinen out of the second race. 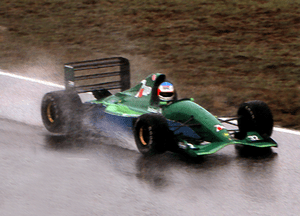 It was also in 1990 that Schumacher’s career deviated from the usual path of a single-seater driver. At the time, it was normal to progress through Formula 3 to Formula 3000 and then on to Formula One. But Schumacher, on the advice of Willi Weber, went instead to the Mercedes junior racing programme which involved racing for the Sauber-Mercedes team in the World Sportscar Championship, along with his racing in Formula 3. 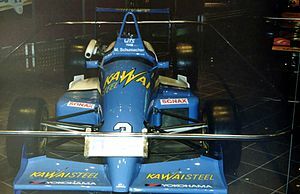 At Sauber, Schumacher raced alongside Heinz-Harald Frentzen and Karl Wendlinger, both of whom would race against Schumacher in Formula One. The three young drivers were mentored by the experienced Jochen Mass and learned critical skills, including how to be fuel efficient without losing time. He could not have known it at the time, but Schumacher’s involvement with Mercedes would play a crucial role in his promotion to Formula One, in the form of financial support. 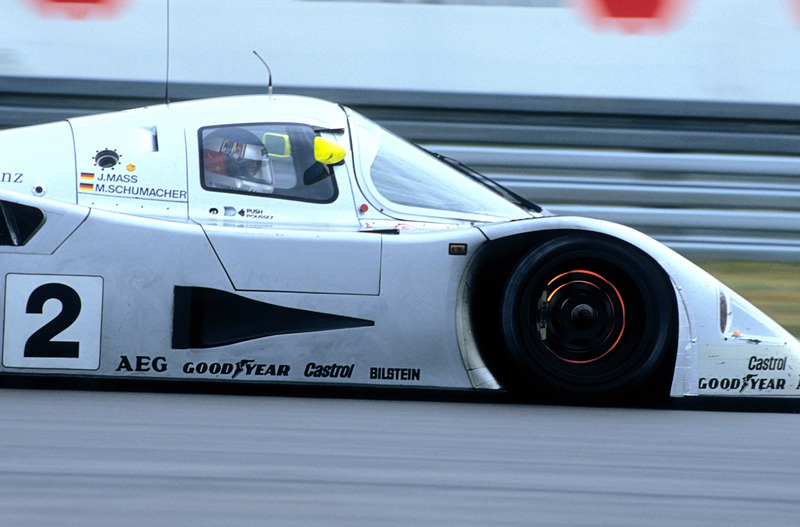 Schumacher showed his speed in the 1990 World Sportscar Championship by finishing fifth despite only competing in three out of the season’s nine races, the last of which he won. He would win the final round of the 1991 season as well, although he finished only ninth in the championship that year. However, in the grand scheme of Michael Schumacher’s career, the World Sportscar Championship of 1991 would take a back seat to a much more significant event – his Formula One debut. Leading up to the 1991 Belgian Grand Prix, Jordan driver Bertrand Gachot was handed a two-month jail sentence for attacking a London taxi driver with CS Gas. Consequently, Eddie Jordan needed a driver to take over one of his cars at the demanding Spa-Francorchamps circuit. Willi Weber, who was managing Schumacher at the time, contacted Jordan and after some coaxing, which included the promise of a payment of $150 000 from Mercedes for the race, Schumacher was given the drive. Spa is a daunting track. It was then, and still is now, the longest track in Formula One, and it has some of the fastest and most challenging corners in world racing. The Raidillon and Eau Rouge corners are perhaps the best known piece of race track in the world. The cars plunge down a hill before flicking left and then turning right up another steep hill and then left again at the top of a blind rise – all without lifting off in the dry. It’s spectacular to watch and is said to be thrilling to drive. When Schumacher arrived at Spa in 1991, he had never driven the track, which almost caused Eddie Jordan to backtrack on his agreement to put the young German in the car. But he needn’t have been concerned – Schumacher hopped on his bicycle and learned the layout by riding it, before going out in practice the next morning and astonishing the Jordan engineers with his lap times. By now, the story of Schumacher’s performance in qualifying for the 1991 Belgian Grand Prix is the stuff of legend. A driver in his first race normally aims simply to keep the car on the track and not make too much of a fool of himself. Schumacher had other ideas, and went about his qualifying session with the confidence that would characterise his entire Formula One career. Schumacher’s team-mate for that race was the experienced and well-regarded Andrea de Cesaris, who was expected to show Schumacher the ropes. De Cesaris qualified 11th, which was not a bad performance in that year’s Jordan. Schumacher put his car seventh on the grid, seven tenths of a second quicker than de Cesaris and quicker even than the Benetton of Roberto Moreno. At the start of the race, Schumacher made up two places to fifth on the run down to the first corner, before dropping back to sixth on the exit of the corner. Unfortunately, that was it for Schumacher as his clutch failed going into Eau Rouge and he coasted to a halt at the top of the hill. While it was a disappointing end to his first race, his qualifying performance ensured that this young, fresh-faced German was the talk of Formula One. His talent was obvious. Where it would take him was beyond the imagination of anyone in Formula One at the time. But he was clearly something special. Michael Schumacher had arrived in Formula One.